Like That 40% Return? Better Understand Risks First. A July 20th WSJ article featured Quantedge Capital, a quantitative global macro hedge fund manager that gained 40% after fees year-to-date through June. We provide a quantitative insight into potential sources of such performance. According to the investor letter cited in the article, the fund’s extraordinary returns were attributed to leveraged bets on fixed income securities. Such performance obviously comes with a cost – the article mentions 30% target annual volatility (standard deviation). 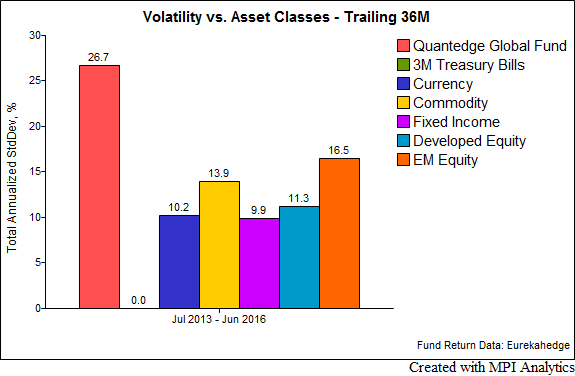 Based on our analysis of the fund’s trailing 36 months of monthly returns, the volatility is in this range and is higher than any of the traditional asset classes – even emerging markets and commodities – as shown in chart below. Now we will attempt to create a hypothetical portfolio of the major asset classes that would have delivered similar returns to Quantedge Global with a similar risk in 2016. 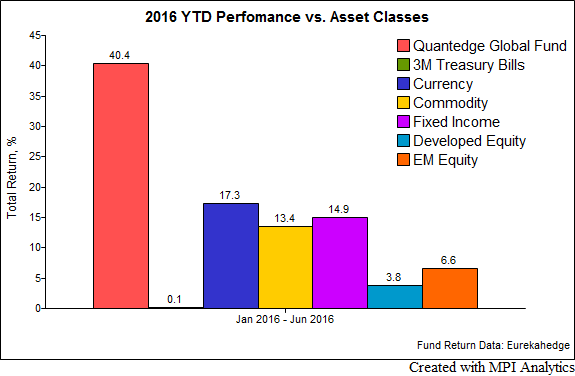 Obviously, there are infinite ways one could explain a 40% six-month return by leveraging any of the asset classes above. However, if we also require that such a hypothetical portfolio mimics the fund’s return month-to-month over the past, say, 36 months – this becomes an infinitely more complex task. We used our Dynamic Style Analysis (DSA) to perform this analysis, the results of which are shown below. The resulting asset class “exposures” do not represent the actual positions that were held by the fund, but rather the combination of indexes that best mimic its returns. For an investor curious how such performance could have been achieved, it provides some useful insights. The chart below shows the product of the DSA analysis – a hypothetical portfolio of indexes that accurately captures the performance swings of the year-to-date period as well as the past 36-months.